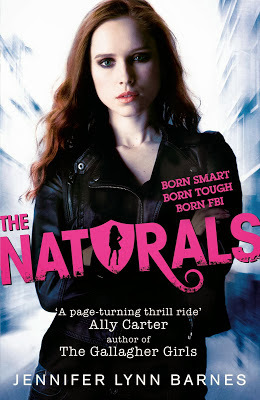 Cassie Hobbes is joining The Naturals: a secret FBI programme for exceptionally talented teenagers. But when a new serial killer strikes close to the Naturals HQ, Cassie starts to learn all about mortal danger - outside the classroom. Cassie's mother was murdered five years ago, but the killer was never found and neither was the body. Cassie has always been good at reading people; her mother taught her to look for BPE - behavior, personality, environment - so when Cassie is approached by a mysterious guy in a cafe who invites her to be part of The Naturals, a secret FBI programme for people with special abilities, she jumps at the chance. Maybe she can find her mum's killer and put her skills to good use at the same time. I know we all say you shouldn't judge a book by its cover, but I did. As soon as I pulled this out of the jiffy bag I knew I would love it. Turns out I was right! Cassie is an awesome, badass member of the FBI whilst still being relateable and having a relatively normal life. I loved how unique everybody was! Cassie and Dean, able to infer the personality and intentions of people by Profiling them. Michael, able to detect every emotion someone is feeling just by looking at their face for a second. Sloane, who is constantly spouting statistics and facts, and Lia who can spot a liar in the blink of an eye. All of these rare kinds of people made the book even more interesting - I just couldn't get enough of it! A lot of people have complained about the love triangle between Cassie, Dean and Michael. I agree that it did seem unnecessary, but I liked it at the same time and it will probably develop later on in the series anyway. I think Cassie and Dean belong together - if any of you have read 'The Naturals', what do you think? I found the psychology side of 'The Naturals' really fascinating. It was interesting to read how each character formed their individual opinions on the criminals, and how they could link clues to form the bigger picture. I love the cover of this as well as the whole idea. It sounds so good. I loved the Gallagher Girls and they sound quite similar, so I'm sure i'l enjoy this one too. Glad you liked it, Great Review! It sounds like your kind of book. Thanks, Sunny! I don't read too many books like this, but I have to say that this sounds quite exciting! I might just pick it up. I've heard this getting quite a bit of press in the YA blogging world recently. There seems to be a bit of a scramble over giveaways for this book and I have to agree, I like the outline of this book. Also liking the supernatural but in a cool way, in that anyone could have these powers but you wouldn't know because they look, well...Natural. Sounds brilliant, great review, adding to the TBR pile AS I TYPE.